Sillamäe (Russian: Силламяэ), known also in Germanized version as Sillamäggi or Sillamägi (Estonian for "Bridge Hill"), is a town in Ida-Viru County in the northern part of Estonia, on the southern coast of the Gulf of Finland. It has a population of 16,183 (as of 1 January 2010) and covers an area of 10.54 km². Sillamäe is located at the mouth of Sõtke River. The locality of Sillamäggi was first mentioned in 1502 when the area was under the control of Livonian Order. The bridge across Sõtke and a mill in Sillamäggi were documented in 1700. In the 1800s, Sillamäggi developed into a resort village offering a more tranquil experience than the nearby resort town of Hungerburg. Russian physiologist Ivan Pavlov owned a dacha in Sillamäggi and vacationed there during summer breaks in 1891–1917. Among other famous vacationers of Sillamäggi were poet Konstantin Balmont (1905), painter Albert Benois (1898 and 1899), physicist Paul Ehrenfest (1908–1912), botanist Andrei Famintsyn (1890s), historian Mikhail Gershenzon (1911–1914), inventor Boris Rosing (1902–1911), composer Pyotr Ilyich Tchaikovsky (1868). In the 1920s and 1930s, Sillamäe and surrounding countryside saw the rise of the oil shale mining industry in the area. In 1927–1929, a Swedish company Estländska Oljeskifferkonsortiet built an oil shale processing plant and a power station at the location of the Türsamäe manor, on the western side of Sillamäe. This plant reached a total capacity of 500 tonnes per day in the mid-1930s. A small harbour was constructed in Sillamäe to support the plant activities, but it was destroyed during World War II. During the Nazi occupation, several concentration camps were established in the vicinity of Sillamäe to employ slave-laborers in the local mines. Upon withdrawal from Sillamäe in 1944, German forces sabotaged the processing plant. The defensive positions of Germans on the hills to the east of Sillamäe, known as Sinimäed, formed the Tannenberg Line during the Battle of Narva. In 1946–1948, the former oil shale processing plant in Sillamäe was rebuilt by Soviets to extract uranium oxide from the locally mined Dictyonema argillite ore (a type of oil shale). During that time, many war prisoners were employed at the construction and mining activities in Sillamäe. The uranium extraction process at the Sillamäe plant was developed in collaboration with a nearby Narva pilot plant (known as Cloth Dyeing Factory) and produced mainly a 40% uranium concentrate at the onset of plant production. The local mining operations continued until 1952. In the following years, richer uranium ores were imported to the Sillamäe plant from various locations of Central Asia and the Eastern Bloc, mainly from mines in Czechoslovakia, East Germany, Hungary, Poland and Romania including Bihor mine operated by Sovromcuarţ (one of the SovRoms operated jointly by the Soviet Union and Romania). In 1970, the plant started to process loparite ore from Kola Peninsula producing tantalum and niobium chemicals. Later, it also started to extract rare earth metal oxides. In 1982, the plant began the production of reactor-grade enriched uranium (2–4.4% 235U) in form of UO2. Uranium production at Sillamäe continued to supply nuclear materials for the Soviet nuclear power plants and weapon facilities until 1989. In the years of 1950–1989, the plant produced about 98,681 tonnes of uranium (mostly as U3O8) and 1354.7 tonnes of enriched uranium. During its operations, the Sillamäe plant dumped the processing wastes into a tailing pond at the north-western part of Sillamäe near the Baltic Sea shoreline. By the 1990s, the pond presented a serious ecological hazard due to leaching of radioactive and other harmful particulates and dissolved materials into Baltic Sea. In the 2000s, measures were undertaken to secure the containment of the wastes at Sillamäe. In 1957, Sillamäe officially gained a town status. By that time, Sillamäe already grew beyond the historical boundaries of Sillamäggi and included several neighboring settlements including Kannuka and Türsamäe. During the Soviet regime in Estonia, Sillamäe remained a closed town due to the secrecy and security measures related to the uranium production activities at the local plant. After uranium processing ceased in 1989 and Estonia regained independence in 1991, industrial activity at Sillamäe experienced significant decline throughout the 1990s resulting in a high unemployment rate among the local population. The Sillamäe plant was privatized in 1997 to form AS Silmet and continues to produce rare metal and rare earth metal products. It remains the top world producer of niobium and tantalum products including hydroxides, oxides, various grades of metal, metal hydrides, metal powders and NbNi alloy. Among rare earth element products are lanthanum, cerium, praseodymium, neodymium and samarium-europium-gadolinium carbonates, oxides, metals, chloride and nitrate solutions. On 4 April 2011, the American rare earth metal producer Molycorp announced its acquisition of a 90% stake in AS Silmet. The deal was valued at $89 million at the time. The company was renamed AS Silmet-Molycorp. In 2005, a deep-sea port (SILPORT) with facilities able to handle dry bulk, liquid fertilizers and oil was opened in Sillamäe. A regular ferry service between Sillamäe and Kotka, Finland was inaugurated in 2006, but was forced to shut down in 2007 due to a low load factor. However, the cargo operations continue to show a steady growth. In 2011, the Sillamäe port reached 4.9 million metric tonnes in cargo traffic taking fifth place among the largest ports in the Baltic states after Tallinn, Riga, Klaipeda and Ventspils. 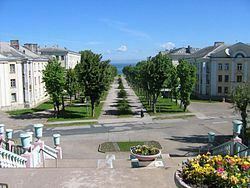 There are several seaside resorts located in the vicinity of Sillamäe (Toila and Narva-Jõesuu) that were especially popular during the Soviet era.